Is it too late to get started on Etsy in 2019? Read these tips for launching a handmade business in a noisy online space. How Do I Get Started on Etsy? Are you afraid of failing on Etsy? Are you afraid of failing on Etsy? When I talk to new students, the #1 issue that people say holds them back from getting started or really taking that leap is because they are afraid of failure. Use this step by step plan to break through the mental hangup and go after your dreams without being paralyzed by the fear of failing! 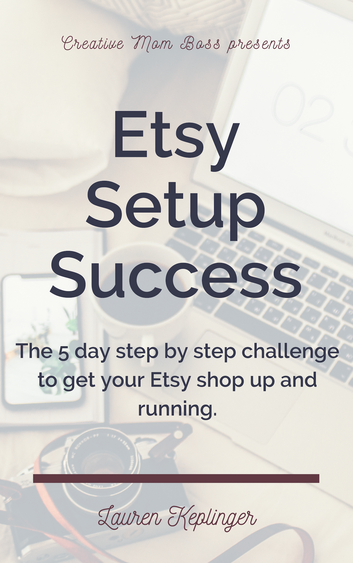 You've Opened Your Etsy Shop -- Now What? Etsy marketing - whether you are a beginning, been selling a while, or are a successful seller looking to take it up a notch, this blog post walks you through the next steps in your Etsy marketing plan. Etsy Sales down in 2018? Here are three tips to course correct your shop and make this year the best year you've ever had! You Have an Etsy Shipping Issue...Now What? Military spouses are incredible people. Seriously. I hope your spouse appreciates all the hard work, loyalty, strength, and determination that it takes to be in that very unique role. If they don’t (or even if they do) I’m here to virtually pat you on the back -- you’re amazing! What a tough/rewarding/challenging/ and ultimately amazing learning experience it is. So many of these same characteristics make military spouses unique positioned, and uniquely successful, at being able to face to the challenges of being an entrepreneur. Don’t think you have the guts to run a business? Think about that time you moved across the country and didn’t know a single soul, only to meet your bff for life and thrive in the new environment? Think about when you hugged his neck and watched your husband get on the bus to deploy, and you were stationed 26 hours away from your family and had just arrived from a PCS two months before. Scary business goals? Pshhh. You’ve got more guts than you know what to do with. Don’t think you can put yourself out there like that? Is this even a question? Think about walking into that first FRG meeting to introduce yourself to a new leader and other spouses in the company. Think about interviewing for a job in a totally new town. You’re putting yourself out there all the time. It’s a basic necessity of military a life, and you’re a master at it. Military wives are rockstars. I was and am constantly in awe of the women behind the scenes who hold it all together. I’ve never met a more driven, determined group of people than the Army wives I met while my husband was active duty. Determined to succeed, determined to go after their goals, and with a stubborn desire to excel at every position they were in, from CEOs of companies to volunteer FRG leaders. You won’t see a military wife passively giving up when it gets hard. We are conditioned to set goals and chase after them, and determined to accomplish them. By virtue of necessity, military spouses have a creative and imaginative way of dealing with whatever life throws at them. Household goods haven’t arrived in time for Christmas? That’s ok...we’ll make a tree out of felt and paper. No furniture for weeks while goods are stuck in transit? We’ll make do and camp in the living room. Military spouses have a flexibility to deal with situations that change often and dramatically, and have creative solutions to almost any problem under the sun. Entrepreneurs also need to be able to creatively imagine new products, problem solve solutions to inventory issues, and calmly and cheerfully respond to unhappy customers. Ultimately, it all boils down to this. Military wives the strongest people around. We have the fortitude to deal with a lifestyle and challenges that other people never even dream of - and to do it all as a sacrifice to our husband’s career (happily, nonetheless...at least most of the time). This strength will carry through as an entrepreneur - in the way that you deal with setbacks, in the way that you handle customers, and in the goals that you set for yourself and your business. Being a military spouse and Etsy shop owner are a match made in Heaven -- the very same traits that have made you a successful military spouse will be a huge boost to your ability to be an entrepreneur. Being a business person can be taught -- and I can teach you that -- but being a strong, determined, driven person with the grit to stick with something is a unique characteristic that will set you on the path to success in anything you do. I’m super excited to announce that I am offering military spouse scholarships for the VIP Etsy Roadmap to Success 8 week training course (plus one on one training!) on how to take your Etsy shop from a side gig to a full time income. If you are a military spouse and would like to apply, please visit the scholarship application page. Etsy in 2018 -- Should I offer free shipping? Etsy in 2018 — should I offer free shipping? How to market your shop in 2018 to compete with big box stores - and my own story of experimenting between a sale and a free shipping offer.